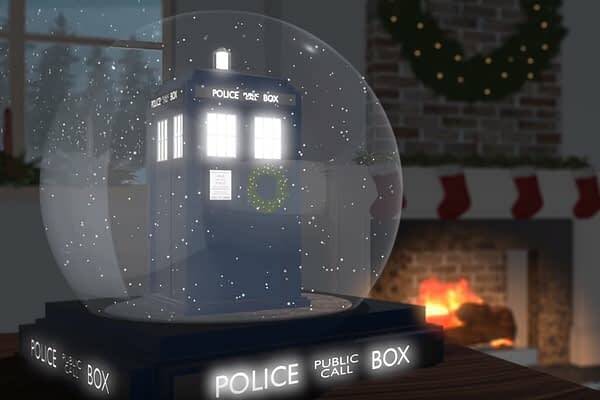 For the Whovians among us, BBC America has released a video yule log of the Tardis to help promote the Doctor Who Christmas Special that airs tomorrow night. It is, of course, the final time we’ll see the 12th Doctor played by Peter Capaldi before he regenerates into the 13th Doctor played by Jodie Whittaker. And as part of the special, we get David Bradley playing the 1st Doctor. With the change in doctor, we also get a change in showrunner for only the third time since the series returned in 2005. Steven Moffat steps down after having taken over for Russell T. Davies. Moffat, who is also the co-creator of Sherlock, will be passing the baton on to Chris Chibnall (Broadchurch). Davies run started with Christopher Eccleston as the 9th Doctor and David Tennant as the 10th. Moffat began his tenure with Matt Smith as the 11th Doctor, brought back Paul McGann for a brief time as the 8th Doctor, introduced us to John Hurt as the War Doctor and even had a cameo by the 4th Doctor, Tom Baker, as the Curator. Plans for Moffat and Capaldi after the Doctor are unknown at this time, but I’m sure fans would be happy to get more Sherlock if Benedict Cumberbatch and Martin Freeman have the time. And Capaldi could follow in the footsteps of both Eccleston and Tennant and take up a role of a villain in the Marvel Universe.